Range Rovers or Landwind X7s? 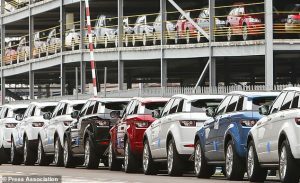 Jiangling Motor Corp has lost out in a legal battle with Jaguar Land Rover (JLR) over accusations that the Chinese manufacturer had copied the Range Rover Evoque. The Mail Online reports that ‘copycat cars’ have been appearing since the Chinese car industry started to grow, and that there have been several domestic brands that have produced “almost like-for-like duplicates of popular models sold in Europe.” However, until this recent case, local law has traditionally protected these Chinese brands in legal disputes. Prior to the JLR cases, the local Chinese courts have upheld the claims of the domestic brands when they insisted that their designs are different enough to legally pass as their own models. This made it frustratibgly difficult for the makers of the original models to win legal cases and put a stop to the practice. 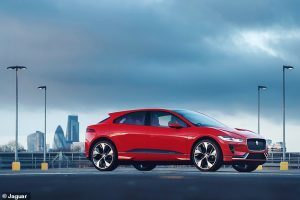 However, this week’s ruling could set a new precedent for European car makers after the court ruled in favour of Jaguar Land Rover, even if the legal wrangling took three years. When the Evoque and Landwind are seen side by side, it is hard to dispute the similarities, although there is a huge difference in the price. And now, as a result of the verdict, all sales, manufacturing and marketing of the Landwind vehicle are to cease immediately and JLR must also be financially compensated. Hire a genuine Range Rover or Jaguar from Titanium Luxury Hire today. 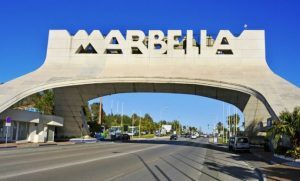 We can deliver to your hotel, home or an airport. Stefan Winkelmann, Bugatti CEO at Geneva. Bugatti has halted its pursuit of building faster cars and has announced that it is looking into building a more practical model to its line-up. 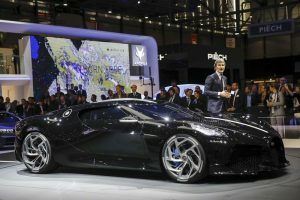 It has just unveiled the world’’s most expensive car at Geneva Motor Show – the $16.7 milliom 57SC Atlantic. So, speed is definitely not going to be important. This is a dramatic drift away from its usual models. The Chiron for example has 1,500 horsepower and a top speed of 261 mph/420 kmh. As Bloomberg points out, Bugatti has room for expansion of its range. 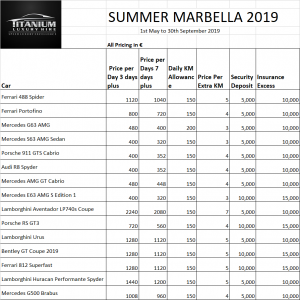 The firm’s average customer has 42 cars at home, according to a Bugatti spokeswoman, and two of tem are likely to be Bugattis. As they also pointed out, more than half of the 250 Chirons made were purchased sight unseen; this is remarkable given the price tag. Have you ever driven a Bugatti? Hire our Bugatti Veyron and discover why people love this marque. We provide Bugatti rental across Europe. See the Locations page for details. We can deliver your Bugatti to your hotel, home or airport. Hire a Bugatti today! Ray Massey test drives the Evoque’s X-ray vision. Have you ever wanted superpowers? Yes, of course you have; we all have. Often X-ray vision is one of the most popular superpowers, but did you know that you could have the power to see through objects when you drive Range Rover’s latest Evoque model? Plus, if you are a Vegan, or simply environmentally conscious, owners can choose interior fabrics made from recycled plastic bottles and plant-based fibres as an alternative to traditional leather. Naturally, the Evoque also offers electric and hybrid power options. But it may be the system called ClearSight Ground View that attracts many cusotmers, even it is an optional extra that costs £575. 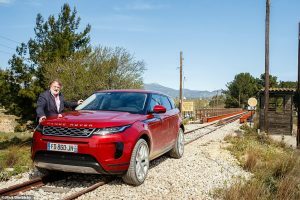 It uses cameras mounted in the front grille and on the door mirrors that project their view onto the central touchscreen of the Evoque so the driver can see in a 180 degree view what is ahead of, and underneath, the front of the vehicle. Actually it does have a very practical use, particularly in cities, as it helps drivers to spot high city centre kerbs when parking, and therefore avoid scuffing their wheels. The ‘smart’ rear view mirror gives drivers ‘eyes in the back of your head’. This has been specifically designed to overcome a problem with the restricted view through the narrow rear window, which, while it makes the Evoque look more attractive, is not great for viewing what is coming behind you. Therefore Range Rover has introduced a traditional reflective rear view mirror that transforms at the flick of a switch into a high definition video screen displaying the images from a rear-facing camera positioned above the rear window. This does cost extra. Browse Titanium Luxury Hire’s Range Rover models for hire – and CONTACT US to reserve one.